In 1993 an exhibition was held in the upstairs hall of the old Sunday School building on Town Street, now flats on the upper floors, with doctor's and dentist’s surgeries on the ground floor, to celebrate the rebuilding of the river wall. 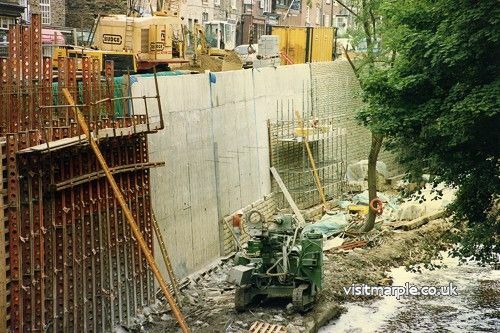 The river wall had collapsed in 1991, leading to closure of Town Street for a year. For centuries the area east of the River Goyt now called Marple Bridge was part of the township of Ludworth in the Hundred of the High Peak in the county of Derbyshire. An exhibition was held at The Reading Room, Hawk Green,between September 20th – 27th 1998 and at Marple Library September 28th – 3rd October 1998.